Bournemouth Are Currently 21/20 To Win! Bournemouth date back to 1890 when they were originally formed as Boscombe St Johns Institute FC, not much of a tongue twister at all! This name only lasted for 9 years as they were then renamed to Boscombe FC, then Bournemouth and Boscombe Athletic FC (what is it with the extra long names that really don't roll of the tongue very well?) in 1923. Finally in 1972 the club were renamed as AFC Bournemouth, a name that stuck. Nicknamed the Cherries the team play homes games in red and black at Dean Court, which is now known as the Vitality Stadium. The 2015-16 season saw them play in the top flight of English football for the very first time and they quickly gained admiration for their passing style of play. Although many expected them to go down if they insisted on "playing" this wasn't the case. 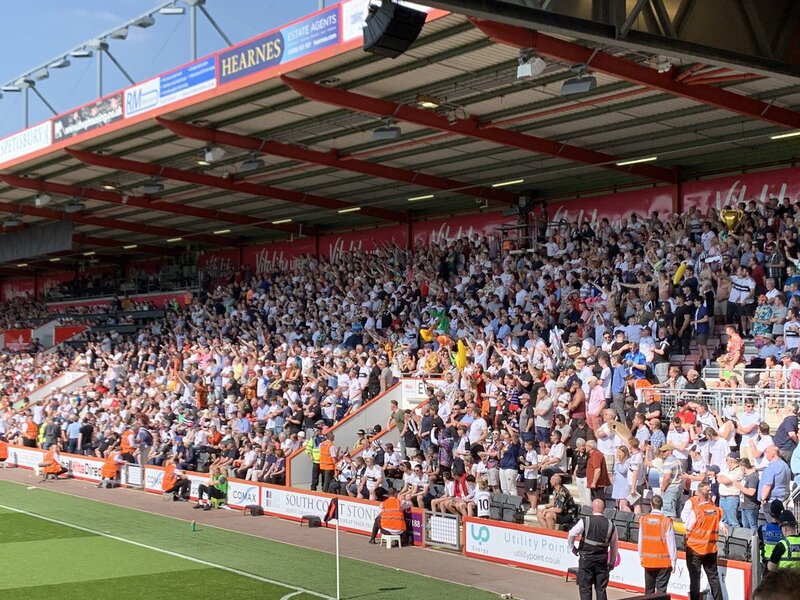 Stand our rivals include Southampton and Portsmouth but basically any team on the south coast tends to bring out strong rivalry. 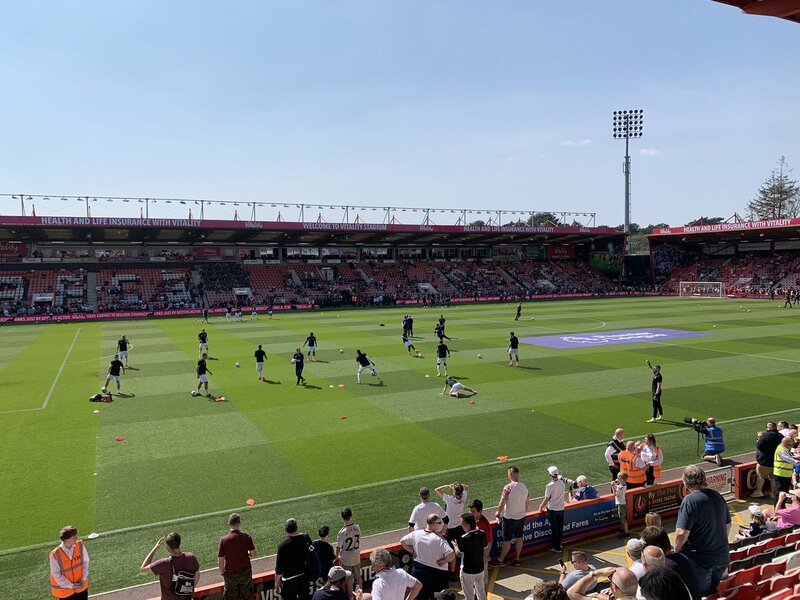 All Bournemouth's club success has been limited to winning lower league titles, the Football League Trophy and the Football League Third Division South Cup. When you think in those terms playing in the Premier League with the current players and management is the golden era for AFC Bournemouth. 45' - Delay in match Sergio Rico - Fulham - - injury. 44' - Delay in match Callum Wilson - Bournemouth - - injury. 41' - Ryan Babel - Fulham - won a free kick on the left wing. 39' - Missed chance. Jean Michael Seri - Fulham - shot with right foot from outside the box is high and wide to the right. Assist - Ryan Sessegnon after corner. 38' - Corner - Fulham. Conceded by Jefferson Lerma. 38' - Shot blocked. André-Frank Zambo Anguissa - Fulham - shot with left foot from outside the box is blocked. 38' - Shot blocked. Ryan Babel - Fulham - shot with right foot from outside the box is blocked. 38' - Corner - Fulham. Conceded by Nathan Aké. 38' - New attacking attempt. Denis Odoi - Fulham - header inside of six yard box - left side is saved by goalkeeper in the centre of the goal. Assist - Ryan Babel with a cross. 37' - Corner - Fulham. Conceded by Steve Cook. 37' - Shot blocked. Joe Bryan - Fulham - shot with right foot from outside the box is blocked. Assist - Ryan Babel. 33' - Ryan Fraser - Bournemouth - won a free kick on the left wing. 27' - Aleksandar Mitrovic - Fulham - won a free kick in defence. 26' - Steve Cook - Bournemouth - won a free kick on the right wing. 24' - Delay in match David Brooks - Bournemouth - - injury. 23' - Substitution - Bournemouth. Jack Simpson for Junior Stanislas - injury. 21' - Delay in match Junior Stanislas - Bournemouth - - injury. 20' - Missed chance. Junior Stanislas - Bournemouth - shot with right foot from outside the box goes high from a free kick. 20' - Callum Wilson - Bournemouth - won a free kick in attack. 18' - Shot blocked. Ryan Fraser - Bournemouth - shot with right foot from the centre of the box is blocked. Assist - Callum Wilson. 17' - Corner - Bournemouth. Conceded by Sergio Rico. 17' - New attacking attempt. Ryan Fraser - Bournemouth - shot with left foot from the left side of the box is saved in the right corner. Assist - Dan Gosling. 17' - Missed chance. Aleksandar Mitrovic - Fulham - shot with left foot from the centre of the box goes high after corner. 16' - Shot blocked. Calum Chambers - Fulham - shot with the head from few metres is blocked. Assist - Joe Bryan with a cross. 16' - Corner - Fulham. Conceded by Ryan Fraser. 15' - Missed chance. Joshua King - Bournemouth - shot with right foot from the centre of the box is very close to the goal. 13' - André-Frank Zambo Anguissa - Fulham - won a free kick in defence. 9' - Ryan Fraser - Bournemouth - won a free kick on the right wing. 8' - Aleksandar Mitrovic - Fulham - won a free kick on the left wing. 6' - Chris Mepham - Bournemouth - won a free kick in defence. 6' - Offside - Bournemouth. Steve Cook with a pass, however Ryan Fraser is in offside. 5' - Corner - Bournemouth. Conceded by André-Frank Zambo Anguissa. 5' - Shot blocked. Ryan Fraser - Bournemouth - shot with right foot from outside the box is blocked. Assist - Dan Gosling. 5' - Joshua King - Bournemouth - won a free kick in attack. 4' - New attacking attempt. Callum Wilson - Bournemouth - shot with the head from few metres is saved in the top centre of the goal. Assist - Nathan Aké. 4' - Shot blocked. Nathan Aké - Bournemouth - shot with the head from the centre of the box is blocked. Assist - Ryan Fraser with a cross. 3' - Corner - Bournemouth. Conceded by Calum Chambers. 3' - Shot blocked. Ryan Fraser - Bournemouth - shot with right foot from the right side of the box is blocked. Assist - Joshua King. 1' - Missed chance. Callum Wilson - Bournemouth - shot with right foot from the left side of the box goes high.